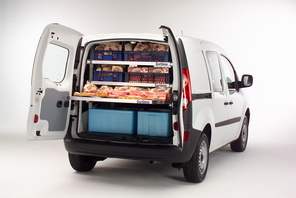 The Sortimo MultiRack is the perfect solution for the efficient transportation of more delicate goods. Installation is easy and quick. The MultiRack gives your vehicle more storage room. The soil-resistant surface makes it is easy to clean. Catering companies, party services, nurseries, flower shops, meals on wheels, pharmaceutical services, decorating contractors and courier services. Easily installed MultiRack turns your CV into a multi-levelled vehicle. The MultiRack height is individually adjustable.